"Have you been to that new French place? I've heard it's amazing!" 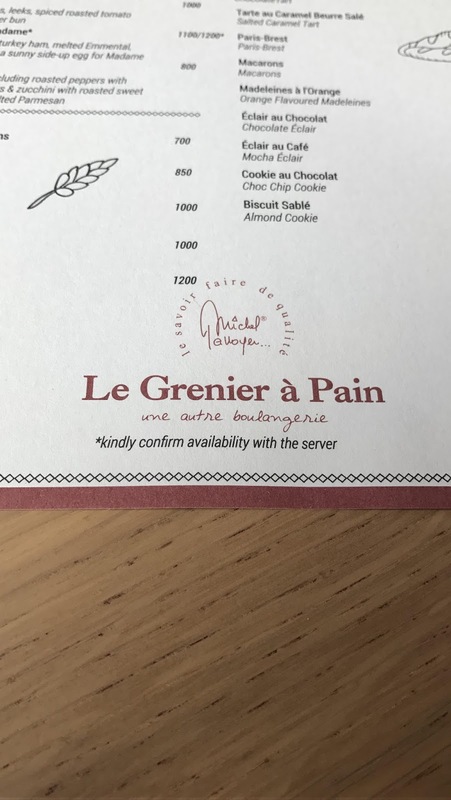 Well, obviously, I hadn't been, and was dying to go, which is why when I planned to meet friends for brunch Saturday morning two weeks ago, I thought it'd be great to try Le Grenier à Pain. Well... brunch with the guys too! And that's just what I came up with in a minute. Why my getting there early was a bad thing - I got to check out the entire menu, and realised I wanted EVERYTHING. 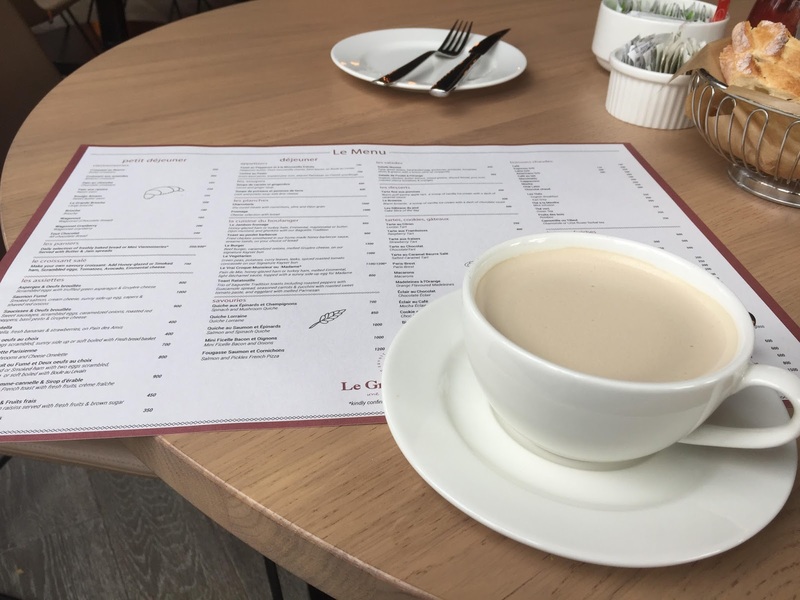 I had gone in having casually scoped the menu online, and I'd decided what I wanted, but after having some time for a thorough perusal, the choice became more and more difficult! To drink, I decided to go for the chai latte. 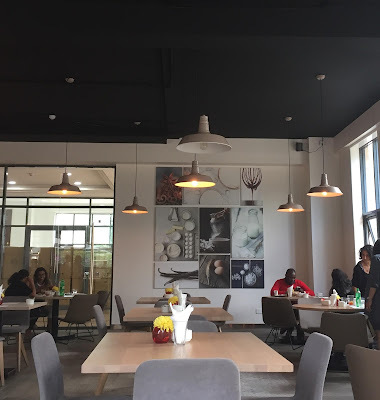 I liked it a lot, and would say it's probably one of the top three you can get in Nairobi. In fact, by the time my friends came, I'd polished off my first and was ready for another! What I liked - it was spicy, sweet and steamy. What could be improved - the spice was slightly diluted, and a bit of a 'milky' flavour came through. I love that before we ordered anything, they gave us some bread. It was yummy, although a little on the tougher side - perhaps because I let it sit for a while! After what seemed like HOURS of indecisiveness, I finally decided to go with my first choice - the pain perdu pomme-cannelle & sirop d'erable (I'm proud that I actually understood part of that!). 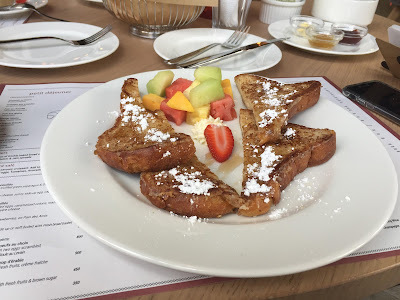 For the rest of us, that's apple-cinammon French toast with fresh fruits, creme fraiche and maple syrup. My friends decided to go with the raisin swirl and the pain au chocolat. The friend who ordered the former said that it was fresh, warm, with a great blend of flavours and it was easily in the top 5 she'd ever had. The pain au chocolat, on the other hand, was nice, but not the best she'd ever had. On my part, I absolutely LOVED my French toast! 9.5/10 for sure. It was amazing - not too sweet, with the subtlety of flavours coming through perfectly. Even more perfection would have been achieved if there were more strawberries in the fresh fruit to go with it! Overall verdict? I would highly recommend this place, and I can't wait to go back! In fact, as I sit here writing this, I made the mistake of looking at their menu (we never learn...) and now I'm hungry. The ambience was great, and the service was amazing! Our server (Faith, I believe) checked in on us enough to be helpful, always had a smile on her face, and seemed like she genuinely loves her job. For a place that's been around since Jan, with their grand opening 3 or 4 weeks ago - well done!! I was having trouble reading the english words packed tightly in small print beneath big and bold french words, when i asked the waiter if there was a menu in english i was rudely told that it was not 'how they do' and was further instructed to just carry on scannig through the different categories in French combing through the english small print until i find what i like. I then decided to grab a plain croissant on the go because i was quite pissed off at that stage, only to find it was stale and tasteless. never again!